One of the bigger surprises to come out of the Toronto International Film Festival this year was the wave of positive reactions and praise in response to director Pablo Larraín's Jackie. The film that is a biopic of the First Lady to John F. Kennedy is said to tell a searingly personal account of Mrs. Kennedy's life in the hours and days following the assassination of her husband. Starring Natalie Portman in the titular role early word is the actor will easily land in the Best Actress category at this year's Academy Awards as Larraín has given Portman a platform on which to craft a version of this person that is more introspective and nuanced than any other portrayal we've seen of this First lady on screen before. And to be honest, this first look at the film for those of us not privileged enough to attend a major film festival is completely astonishing. The visual prowess of the film seems to mirror the light, but striking gravitas of its titular character while the score is as exquisite and classy as most would imagine the real Jacqueline Kennedy Onassis was. It is the narration of this teaser that really drives home the weight the film likely holds though, as the quote from the musical "Camelot," reinforces the idea of sudden change and the more sudden realizations that things will never be the same as they once were. In the stage play King Arthur speaks these words near the end as he comes to realize that the grand notions and the lofty ideas of his beloved Camelot are gone. The Jackie that is the subject of Larraín's film is very much in this same state of mind. By layering in these elements the teaser culminates with a barrage of imagery that figuratively resembles the walls of the Kennedy's Camelot falling down around them. It's more than effective-it is moving even and if Larraín's film can elicit as much of an emotional response as it does in this two-minute clip I can only imagine what the feature film experience might be like. I can't wait. Jackie also stars Billy Crudup, Peter Sarsgaard, Greta Gerwig, John Hurt, Richard E. Grant, John Carroll Lynch, and opens on December 2nd, 2016. 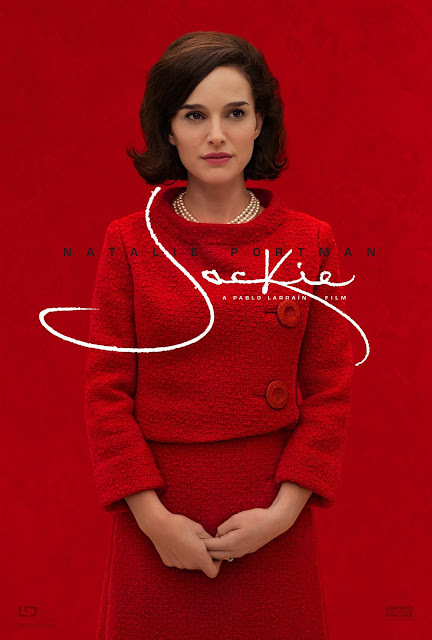 Synopsis: JACKIE is a searing and intimate portrait of one of the most important and tragic moments in American history, seen through the eyes of the iconic First Lady, then Jacqueline Bouvier Kennedy (Natalie Portman). JACKIE places us in her world during the days immediately following her husband’s assassination. Known for her extraordinary dignity and poise, here we see a psychological portrait of the First Lady as she struggles to maintain her husband’s legacy and the world of “Camelot” that they created and loved so well.